Jack Healy scored the game-winner for the Pirates and Jack Ryan also connected in the victory. Liam Fitzgerald made eight saves to lock down the win. Sec. 5 upsets: Two boys soccer teams in the Rochester area suffered their first losses of the season. Rorie Simpson scored in the 56th minute as Fairport avenged an earlier setback with a 1-0 win over Hilton, ranked fifth in the state in Class AA. The shutout was the fifth straight and 10th overall this season for the Red Raiders. Meanwhile, Northstar Christian earned a 4-2 victory over C.G. Finney, ranked second in Class D. Joe Hinds, Ibia Garcia Vazquez, Kevin Anderson, and Collin Nasso scored once each for Northstar. More boys soccer: PSLA at Syracuse Fowler, ranked 18th in Class A, survived overtime to edge Jamesville-DeWitt 3-2 on a Cyrus Etheridge goal. Dieu-Veut Mushefu had tied the game for Fowler with less than a minute to go in regulation. L.I. girls upset: The soccer shocker of the day came in the form of Wantagh (2-3-2) blanking Calhoun (6-1-1) 2-0. Calhoun is ranked fifth in the state in Class A.
Isabella DelaCruz's throw-in set up Brianna Derham for the only goal Wantagh would need seven minutes into the contest. Goalkeeper Erin Murphy made 11 saves. More girls soccer: Maria Williams scored both Edmeston goals as the Panthers beat Schenevus, ranked sixth in Class D, by a 2-1 count in the Tri-Valley League semifinals. • Chloe DeLyser scored five goals and assisted on three others as Marion beat Clyde-Savannah 12-0. DeLyser has 65 goals and 24 assists this season, figuring in nearly 75 percent of her team's 120 goals. Upon further review ... : Dave Barnard, the rules interpreter for the Southern Tier Football Officials, confirmed that officials mishandled the final seconds of Binghamton's 25-21 football victor over Vestal. 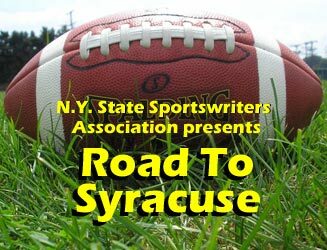 Vestal was deprived of a final play from inside the Binghamton 2-yard line with one second left when officials started the clock to start on the ready-for-play signal rather than on the snap, the Press & Sun-Bulletin reported. Binghamton had been penalized moments earlier for roughing the passer. Though the Golden Bears didn't have a timeout, they should have been given the option to start the final play on the snap under rule 3-4-7, which covers penalties accepted in the final two minutes of either half. Vestal coaches said they were not given that option. "I talked with the crew members and they said, 'We screwed up,'" Barnard said. College decisions: West Seneca West distance runner Anna Rybczynski will sign with Wake Forest next month, The Buffalo News reported. Rybczynski is a five-time Section 6 track and field champion, winning indoor titles in the 600 meters and 1,000; and outdoor crowns in the 1,500, 800 and 400 hurdles. She's also earned a second-place sectional finish in cross country and owns seven school records. • Glens Falls senior two-sport star Joe Girard III will reveal his college basketball destination Sunday night. Girard is deciding between Boston College, Duke, Michigan, Notre Dame, Penn State and Syracuse. Girard's only official visits thus far have been to Boston College and Syracuse. Back, but barely: Highly regarded Long Island Lutheran senior basketball player Essam Mostafa has made it back to school from his native Egypt, but not without some anxious moments. The 6-foot-8 forward went back to his native country at the end of last school year to visit his family and learned that he might not be cleared to leave the country again without first serving a stint in the military that is mandatory for males not attending a school there. LuHi administrators submitted paperwork to the Egyptian government verifying he was a bona fide student here, and Mostafa was cleared to return to the United States after missing 14 days of school.